Does your dog suffer from snow and ice balls building up in their paws on winter hikes? If you have a Husky or Malamute or short haired dog you may have no idea what this is. Although every dog is susceptible to snow packing into their paws, dogs that are bred for snowy conditions or who have short hair generally don’t get these problems as much as other breeds. 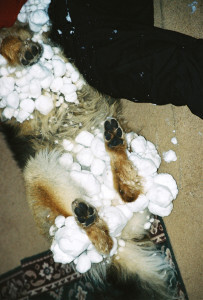 However it is a problem, just check out this photo of a German Shepard/Malamute mix after a spring ski–poor puppy!!! The best option we’ve come across is trimming the hair in-between your dog’s pads to reduce the amount of hair to which snow can stick. My husband’s mustache trimming scissors work well but any pair of sharp, small scissors that you can easily manipulate in-between the pads will work. You can also go to a groomer and have them do the hard work. We highly recommend the people at Animal Lovers Pet Supply at 160 Continental Court (off of Airport Road). Once you are on the trail generously apply Musher’s Wax in-between each pad and most heavily between the toe pads and the bigger “base” pad. You will need to reapply depending on the snow conditions and your dog’s propensity to lick the wax off. The wax is made from a blend of several food-grade waxes so it isn’t bad for your dog to ingest but if they lick it off then there is less on the paw to help repel snow and water which is why we suggest applying it after you are on the trail and there is plenty of fun stuff to distract your dog from licking. Another option is to put booties on your dog’s paws. A word of warning about this option, many dogs hate booties and will chew them off as soon as you turn away. Other dogs will wear them but will walk like they are on the moon which is pretty funny for us humans. Eventually the dog figures out what to do with the booties and walks normally. In the meantime, check out this video of dogs walking in booties for the first time, it will make you smile! The most challenging about designing booties for dogs is that dogs don’t have much in the way of ankles, and a well-fitted boot must hug the ankle joint tightly without rubbing or constricting blood flow. Every dog bootie manufacturer will tell you that they have the best bootie and there is no way to know until your dog tries it out. There are some great online resources reviewing dog booties. One of our clients really likes PAWZ booties. From personal experience they do stay on well but they don’t offer much in the way of breathability. Dogs cool themselves by perspiring through their pads so PAWZ might not be the best in warm weather but they are inexpensive and biodegradable. You can spend a lot of money on booties. A few years ago we spent some serious cash on booties for our dog and he lost one in the snow within 5 minutes. We dug and dug and dug in the area where he lost it but never found that darn bootie! Felt like we just threw money into the snow. The last option is something I’ve only read about. It’s called “candling” and once you know what it is you will understand why I haven’t tried it. Basically it’s where you pass a lit candle quickly over the bottom of the paw. The flame singes the hairs between the toes and is harmless to the dog. The place I read about this recommends practicing on your arm hairs to get the speed right but I haven’t worked up the nerve to do that to myself yet let alone to my dog! So you have options! Again, the one we recommend is trimming the hair and applying Musher’s Wax. Let us know if you have tried something else and how it worked out!